Retina Consultants of Western New York, P.C. physician partners Faruk M. Koreishi, M.D., Paul J. Lee, M.D., Mehdi A. Khan, D.O., Christopher M. Jermak, M.D. 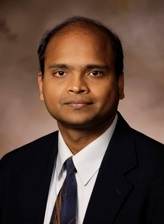 are pleased to announce the addition of Ramakrishna (Ram) Ratnakaram, O.D., M.D. to our staff. Dr. Ratnakaram obtained his first professional degree, Doctor of Optometry, from the University of Houston College of Optometry. Later he received his medical degree from Ross University School of Medicine. He completed his residency in Ophthalmology at UMDNJ-New Jersey Medical Scholl and received the Alfonse Cinnotti Award for Clinical Excellence. He later attended Tulane University College of Medicine for fellowship training in Vitreo-Retinal Surgery, diabetic retinopathy, age-related macular degeneration, retinopathy of prematurity, retinal laser procedures and other retinal diseases and treatments. Dr. Ratnakaram is board certified in Ophthalmology. Dr. Ratnakaram is seeing patients at all three of our locations (Williamsville, Orchard Park and Niagara Falls). Please call (716) 795-2040 to schedule an appointment.